As a OneLogin app vendor, you can implement a OneClick API to provide simple SAML single sign-on (SSO) enablement for your app in OneLogin—in one mouse click. Simplifying the SAML SSO enablement process can help to get your app to users faster. With your OneClick API in place, a OneLogin admin who wants to deploy your app to her user base doesn’t need to worry about manually configuring SAML. 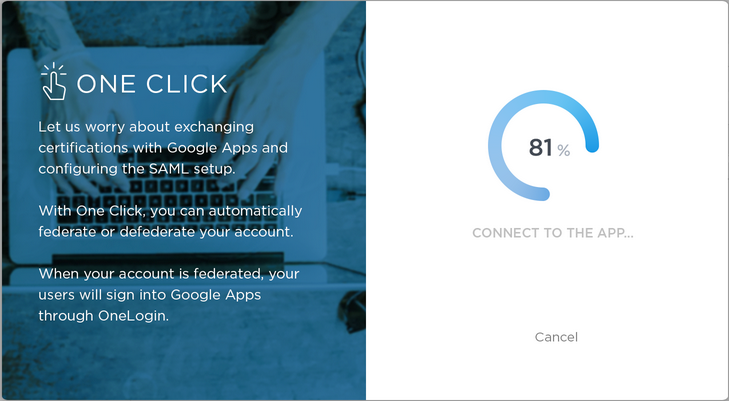 With one click of her mouse in the OneClick UI, the configuration is done quickly and accurately as the UI requests and receives the data it needs to configure SAML SSO for your app from your OneClick API.